Our commenters showed their ear for a good joke this week. Eerie, don't you think? (I wonder if any of them live near Lake Erie?) Okay, okay. Enough with the ear jokes from me. But from you? 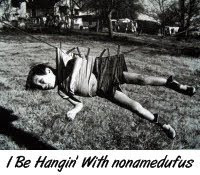 Well let's see who's hangin' with dufus this week. "You see, it's very simple. 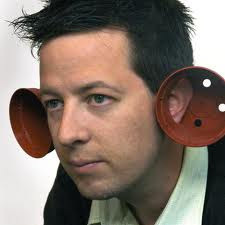 When you wear these specially designed hearing cups, you tune into the frequency emitted by the tiny, red ants and you will hear the secrets of the universe revealed. I am currently annotating all that I have learned from hours and hours of listening to their wise leader, Antera. Coincidentally, she told me that all od the songs of Johnny Cash have hidden meanings." I've always thought that Harry Connick Jr. had a great ear for music...now I know why. The CIA's precursor to the ear bud. Obama's new health insurance plan also pays for hearing aids. Okay, Moooooog, welcome back to the winner's cricle. You be hangin' with the dufus this week. Wah-hoo. Way to go! And thanks to all for playing these captions just keep getting better and better. See you all next Wednesday. Oh, and drop by these people's blogs by clicking on the links. These guys work hard for the funny. Congratulations, Moooooog! It's good to know that I can now afford hearing aids. Congrats to Mooooog! And congrats to the honourables. Thanks for another mention, dufus! 00dozo: No problem. You're mention-worthy. I am always happy to stop by on a Saturday and see this. Thanks for the smiles! Congrats to the great Moooooog! Bluezy: Thanks for playing along. The more the merrier. It was fun to participate, great responses from everyone! E.G. : People had their thinking caps on this week. And their ear caps, too, evidently.